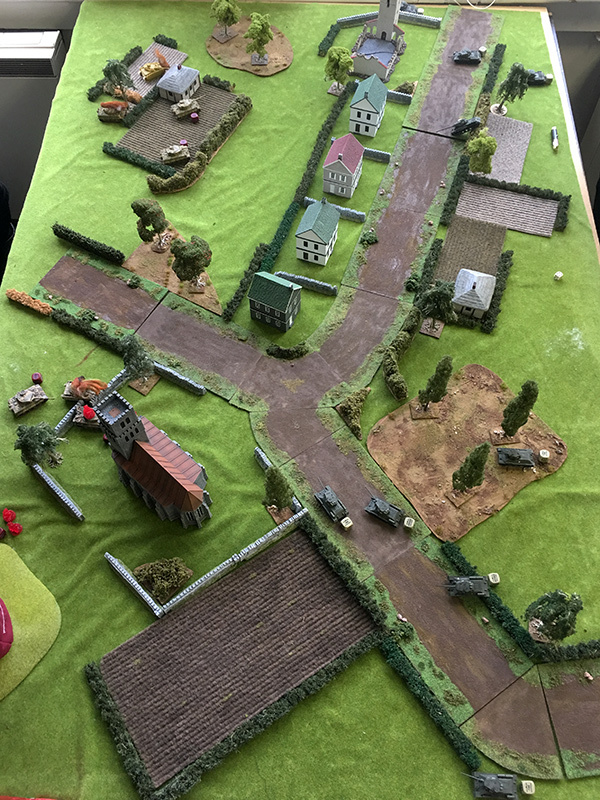 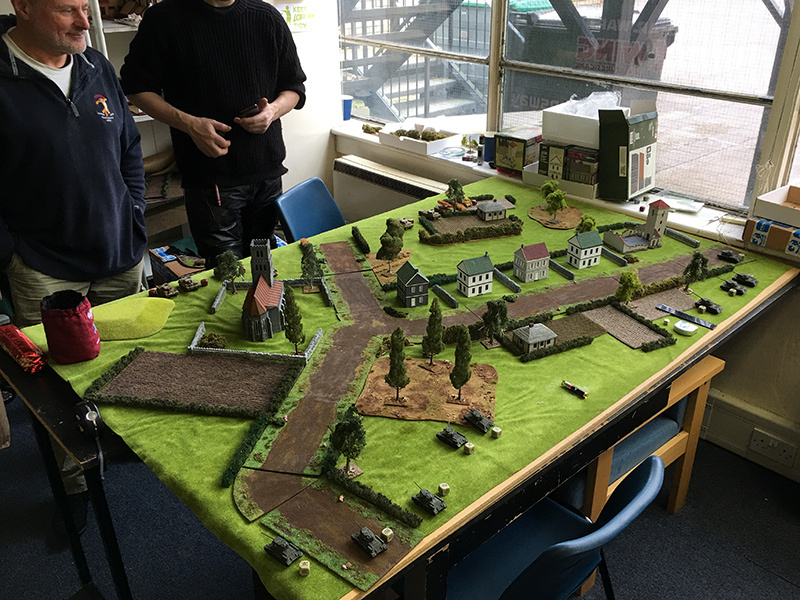 Easter Sunday saw another meeting of the Bolt Action group at Lost Ark Games in Stevenage. 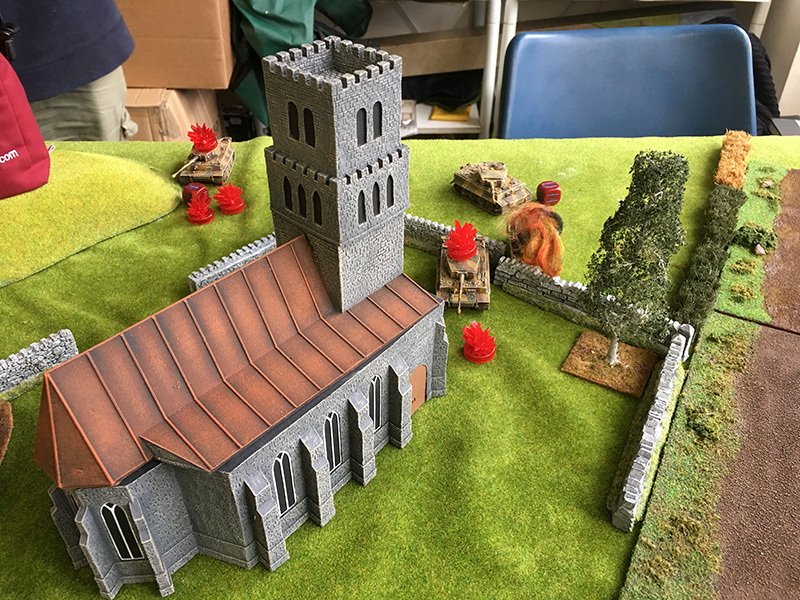 The group meets every 2 weeks on a Sunday. 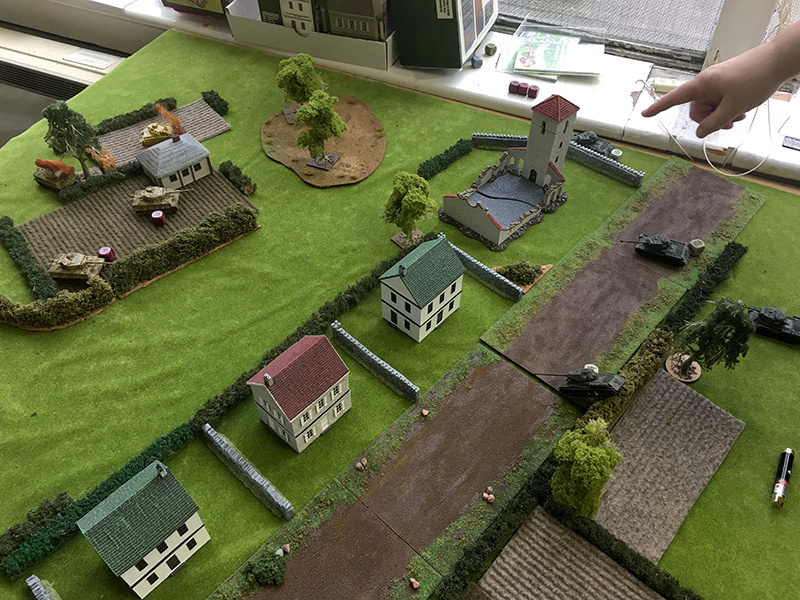 This week four of us did some 15mm Tank Wars. 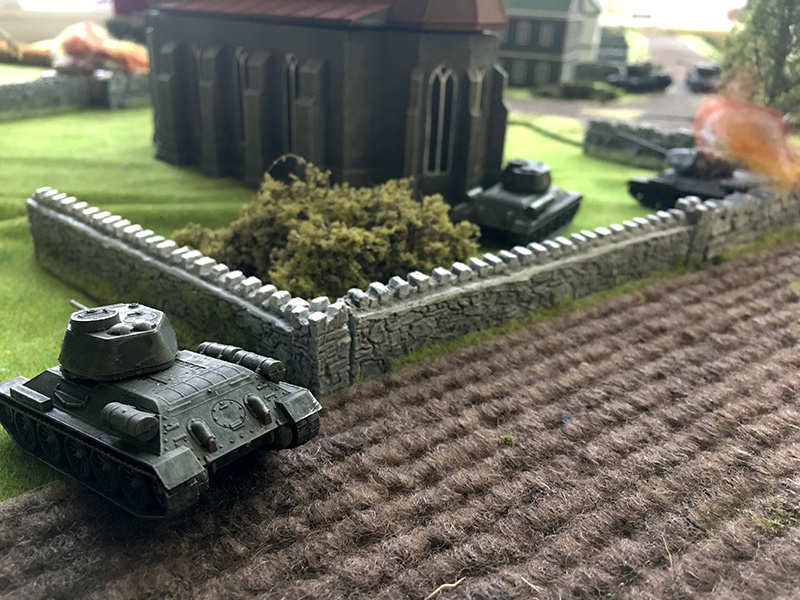 This is normal Bolt Action rules but we measure distance in centimeters instead of inches and fire distances in inches. 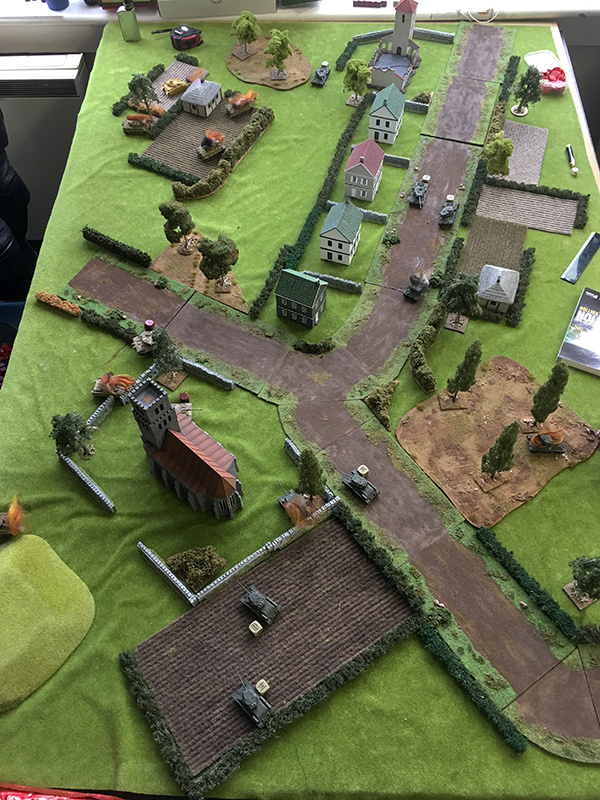 We decided on 3,000 points a side. 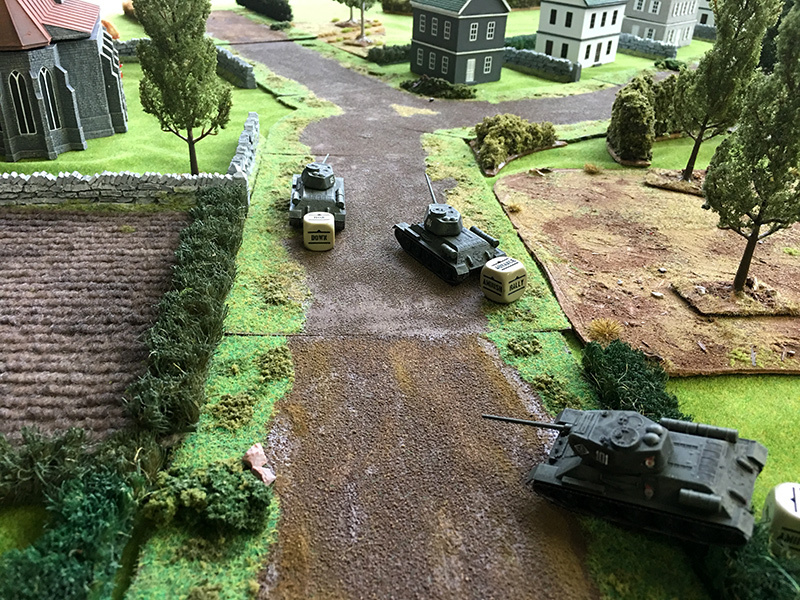 John and I had 4 IS2s, 4 T34/85s and 1 T34/76, all at regular. 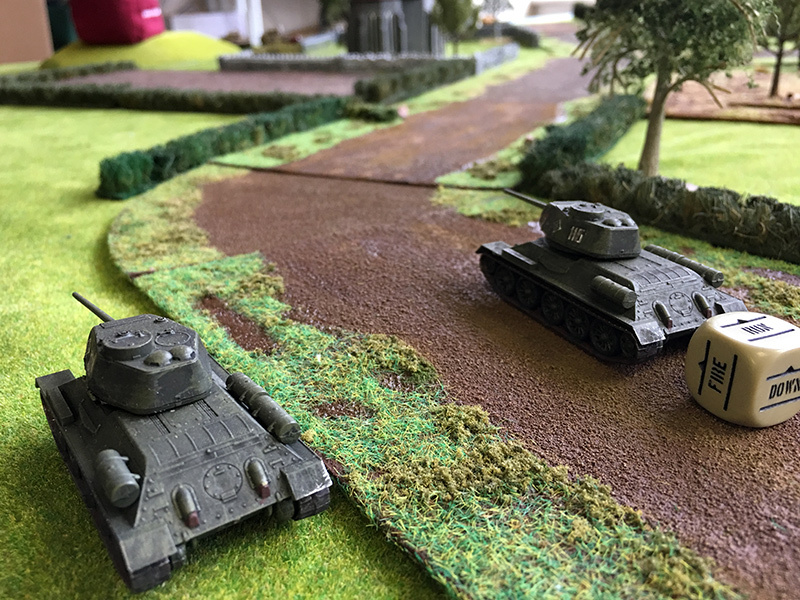 I took the T34s while John had the IS2s. 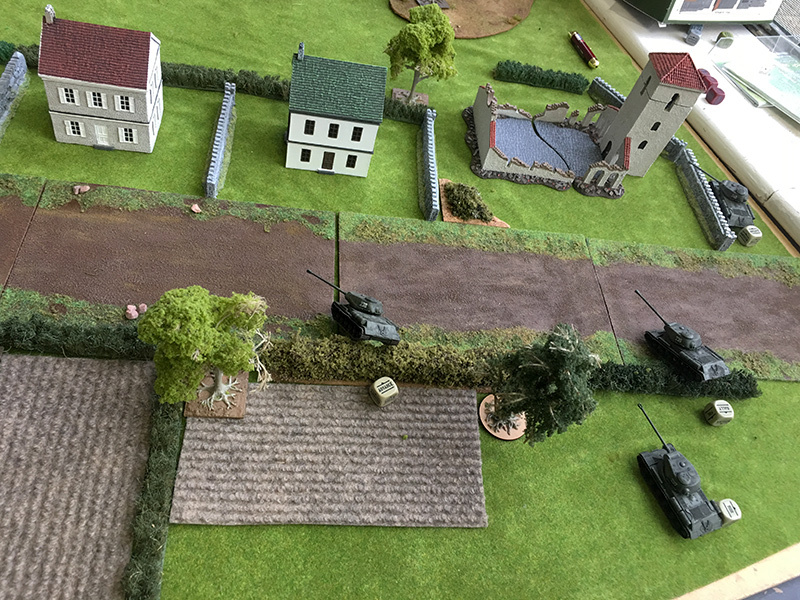 Steve and Brian took the Germans with 3 Tigers and a Panzer 4 each. 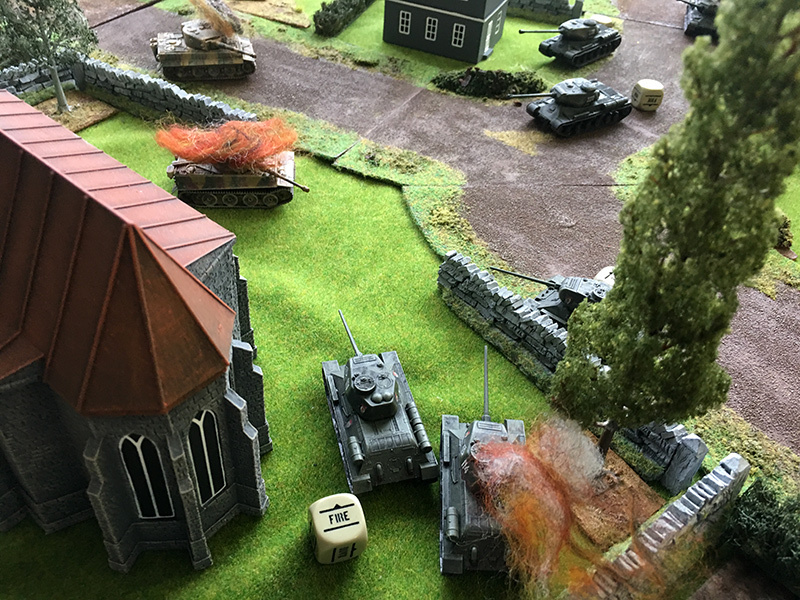 Turn one and all the tanks came onto the table. 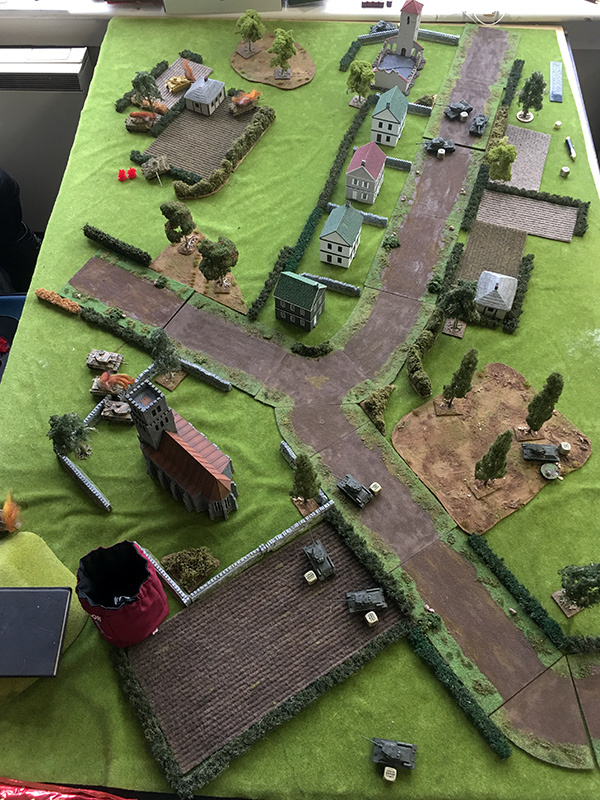 Some at a run and some advanced. 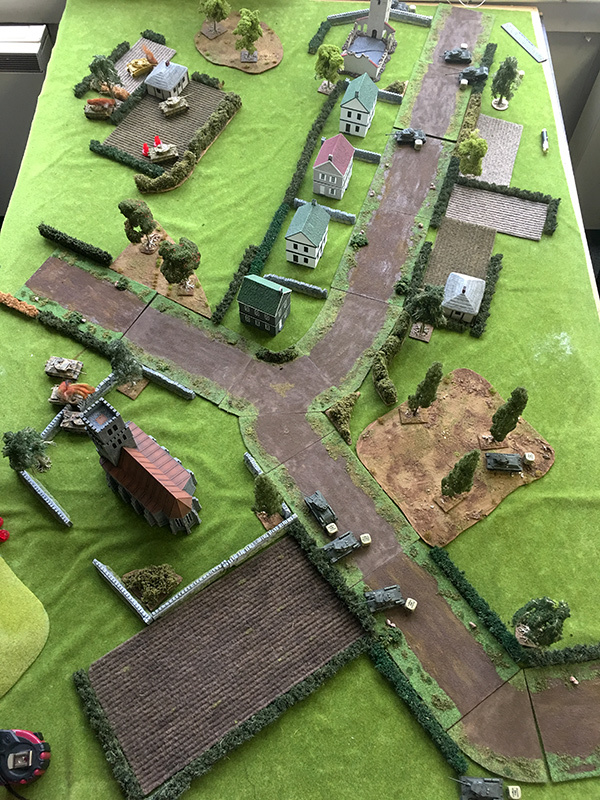 John took the Russian right flank while I took the left against Brian’s German platoon. 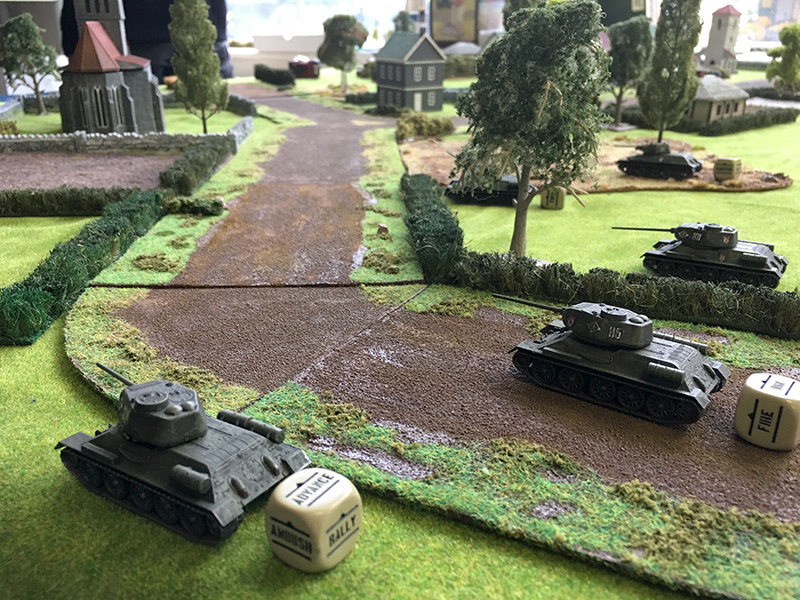 One of John’s IS2s managed to take out one of Steve’s Tigers on the first shot of the game. 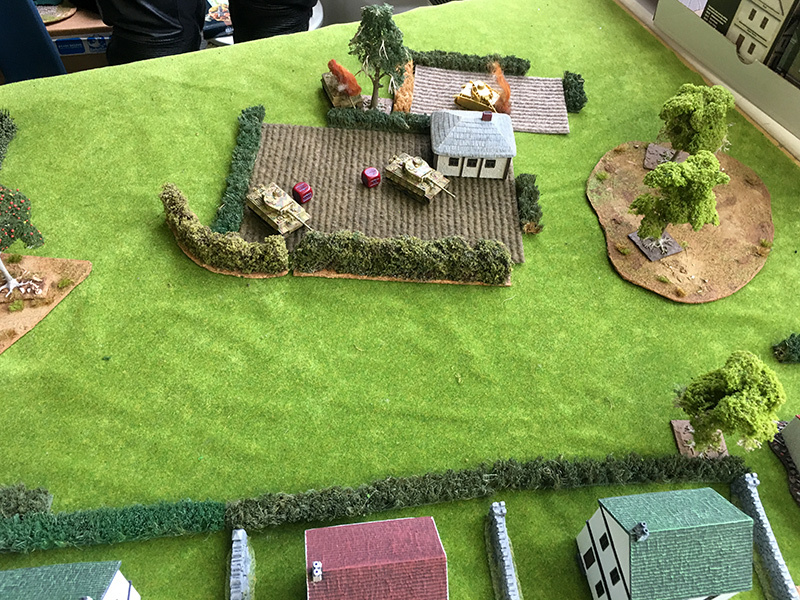 Another IS2 scored a hit on the Panzer 4 and put a couple of pins on it. 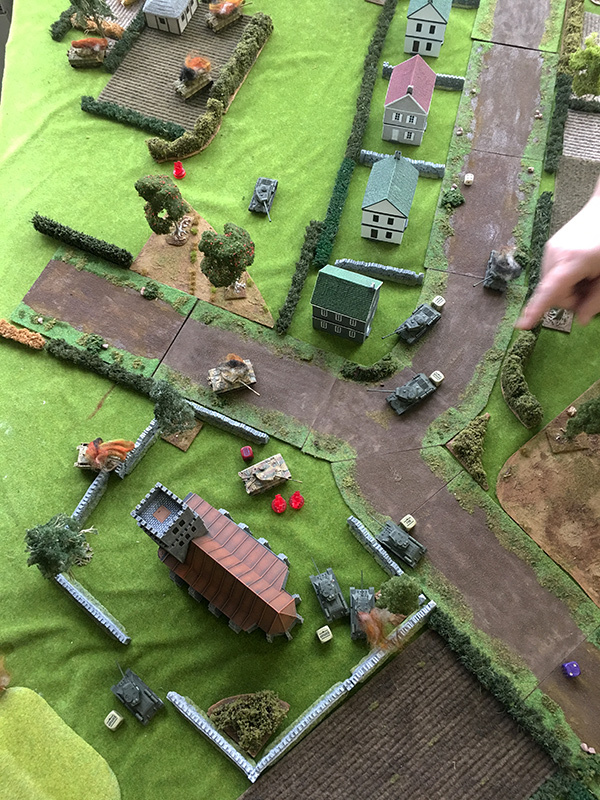 Turn 2 saw John finishing off Steve’s Panzer 4 while my T34/76 managed to take out Brian’s Panzer 4. 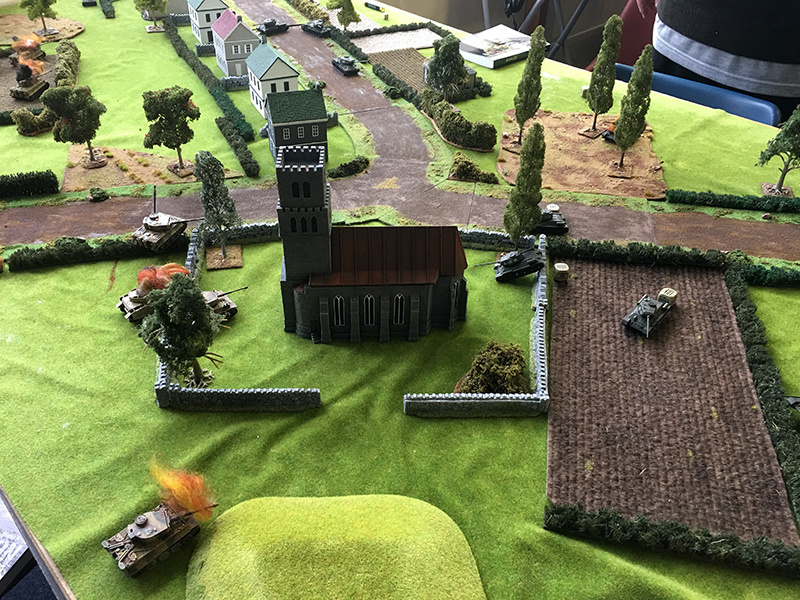 By the end of the turn the Germans had lost 3 tanks without scoring a single hit on the Russians. 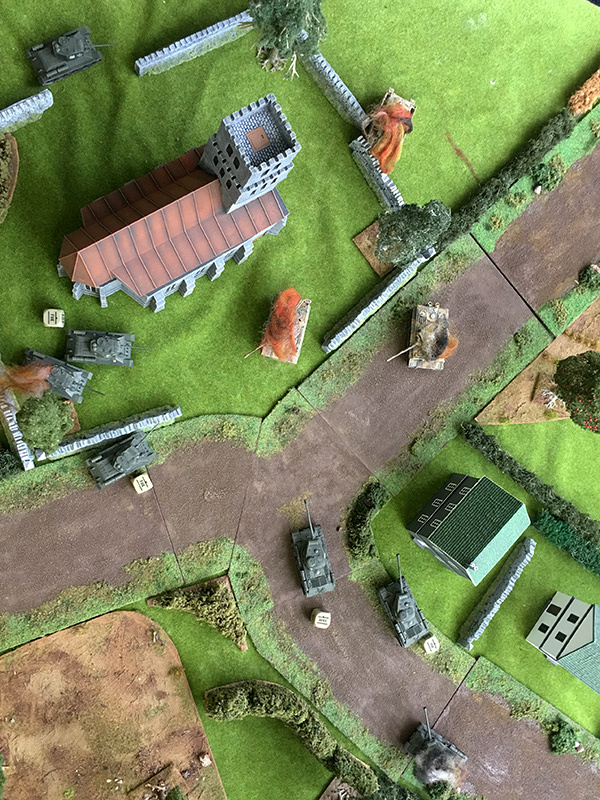 Turn three and the Russian left flank advanced up the road. 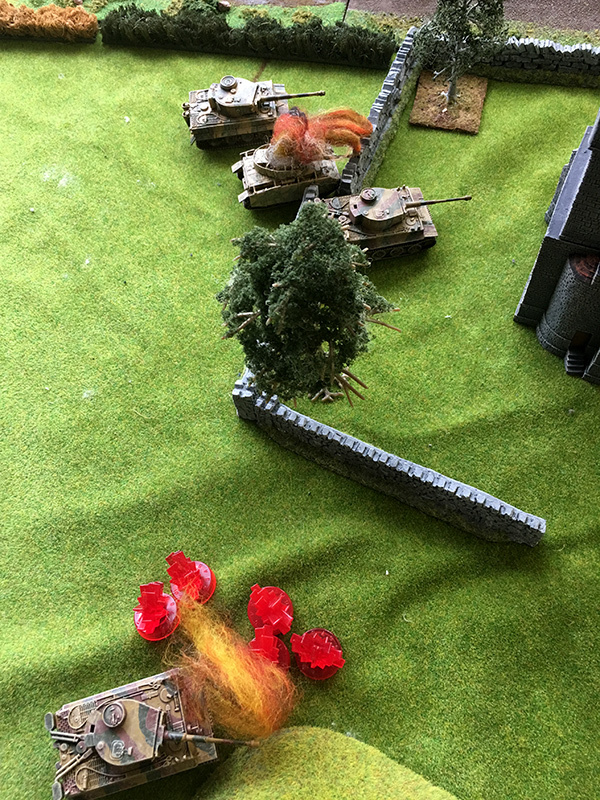 The T34 platoon leader put a couple of pins on Brian’s Flank Tiger which hadn’t moved since it came onto the board. 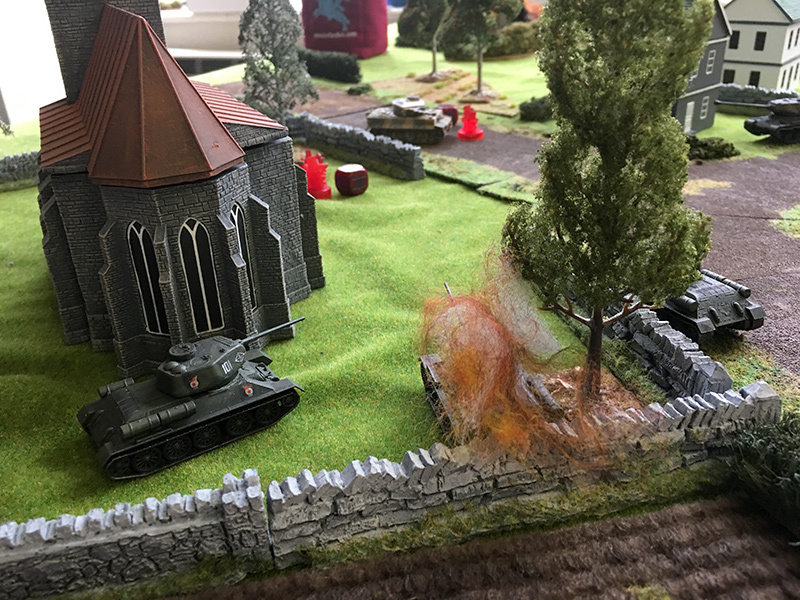 The T34/76 hit the Tiger sneaking up by the church but only managed to immobilise and jam the turret. 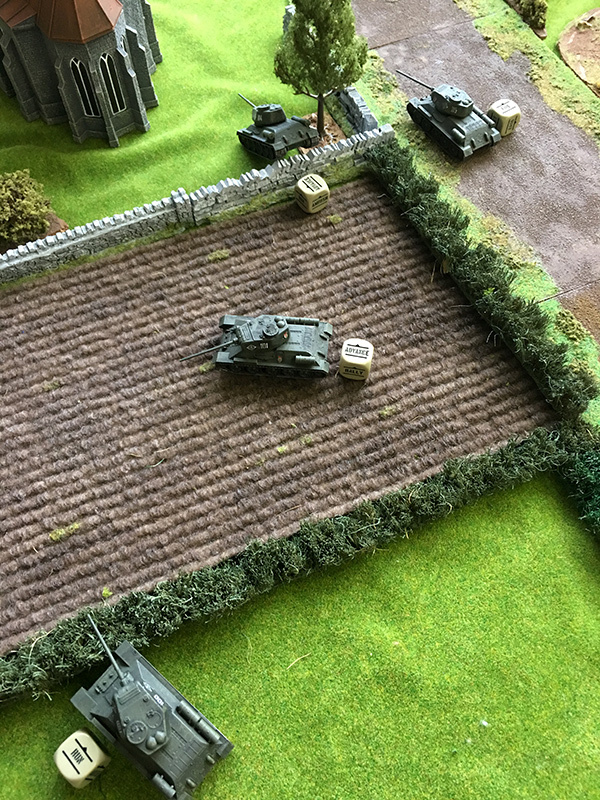 Meanwhile The IS2’s advanced over the hedges. 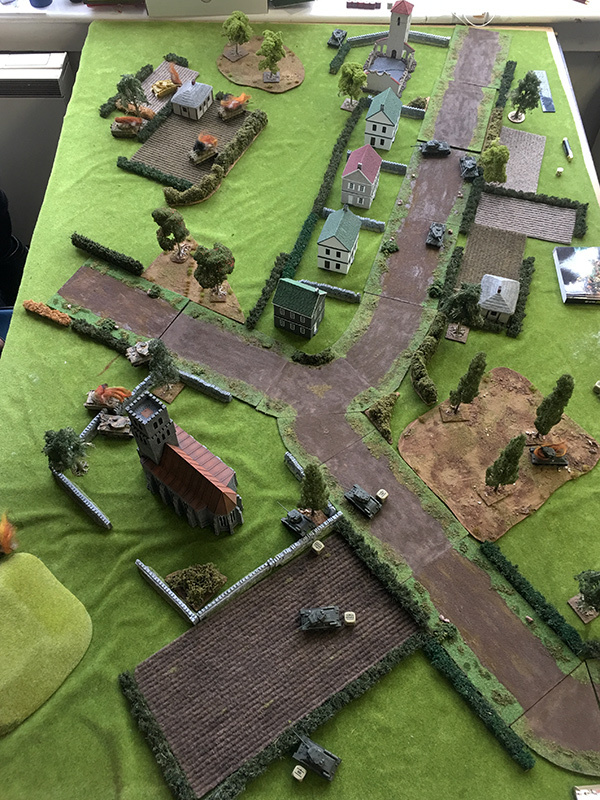 The Germans again failed to score any hits on the Russians. 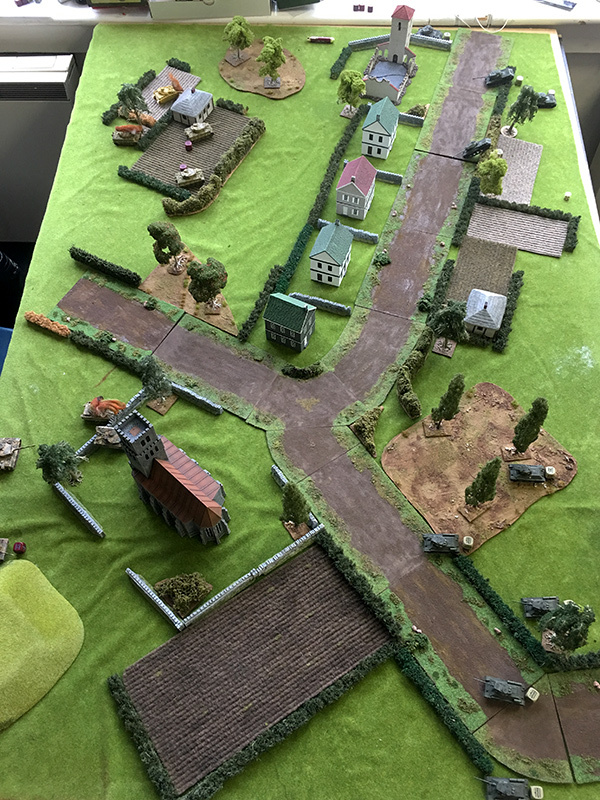 Turn five saw the IS2s finish off Steve’s Tigers and then turn to advance on the German left flank. 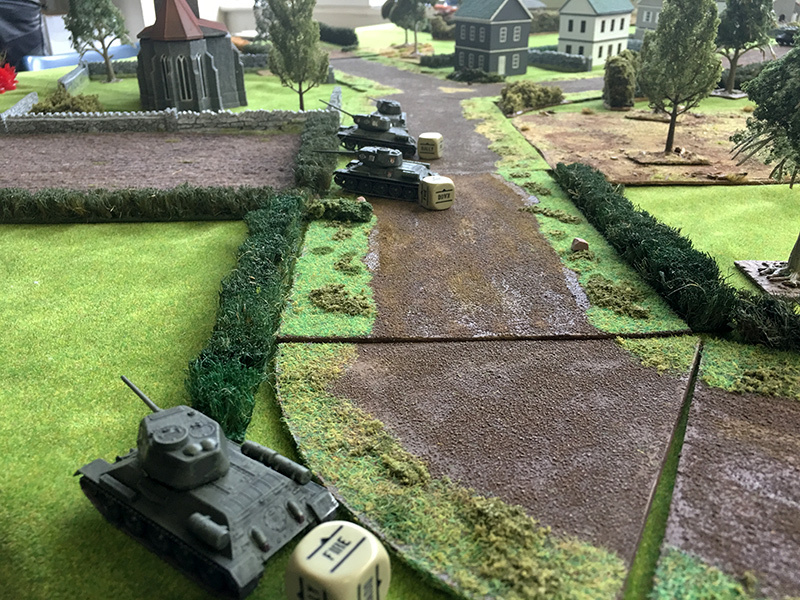 Meanwhile my platoon leader finishes off the Tiger near Brian’s base line. 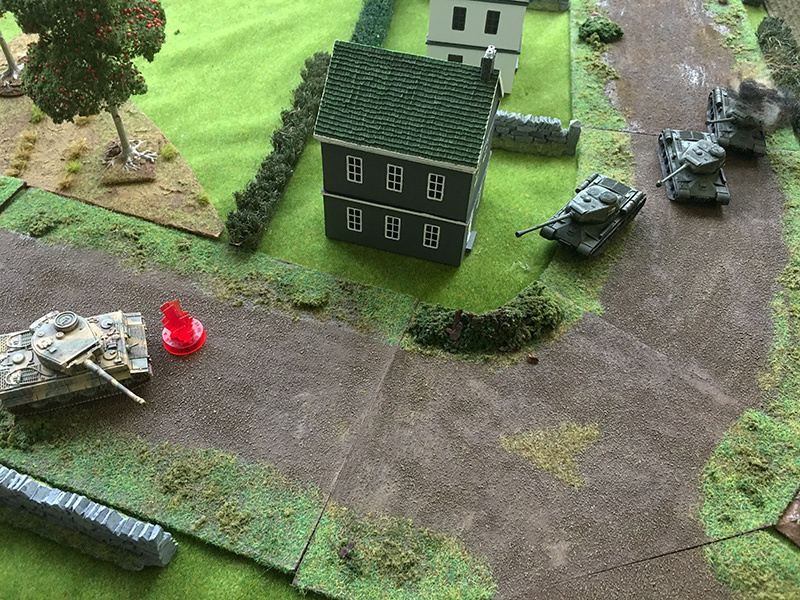 The Germans finally got a hit on the Russians, Brian managing to take out the T34/76. 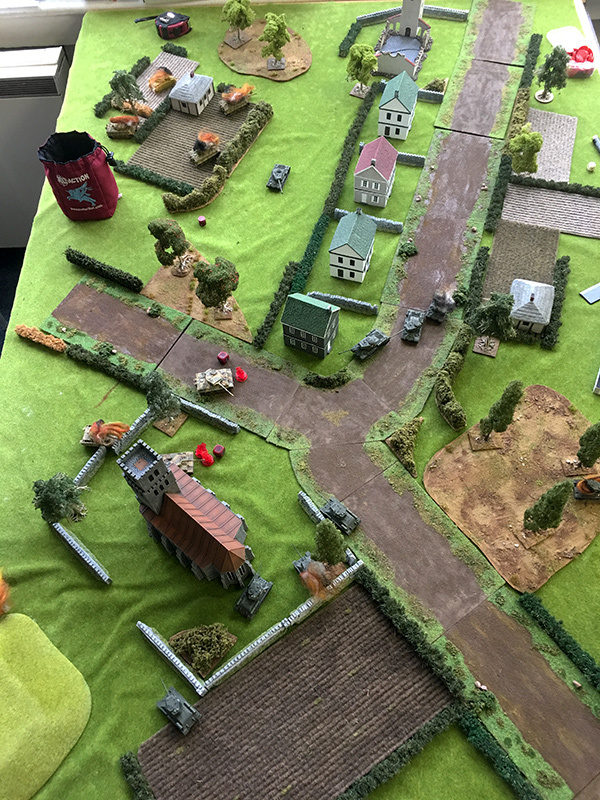 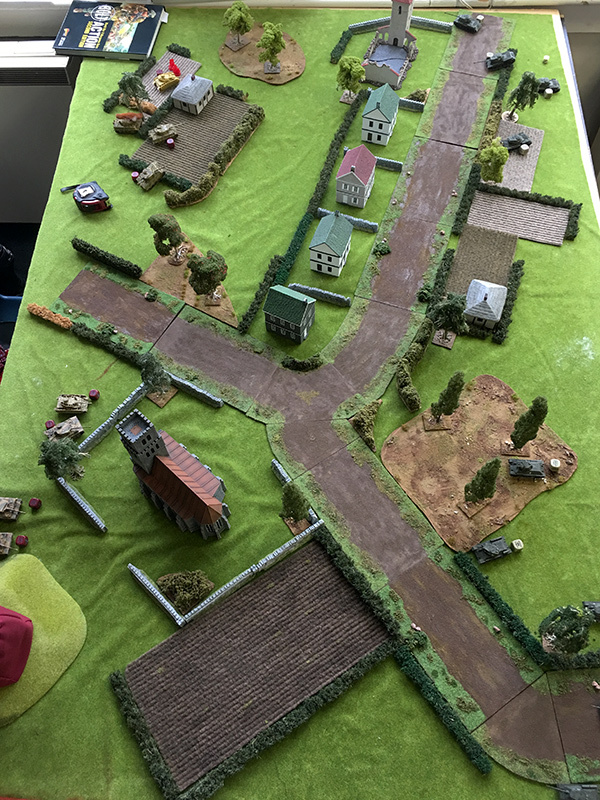 Turn six and John’s IS2s made a beeline for the Russian left flank to help wiping out the remainder of the German forces. 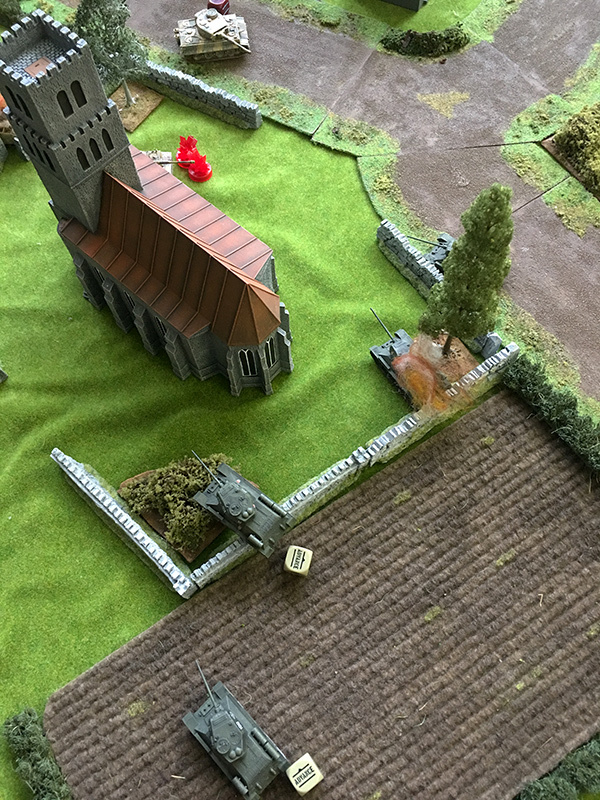 The Russian left flank T34s started to envelope the church to try and encircle the remaining two Tigers. 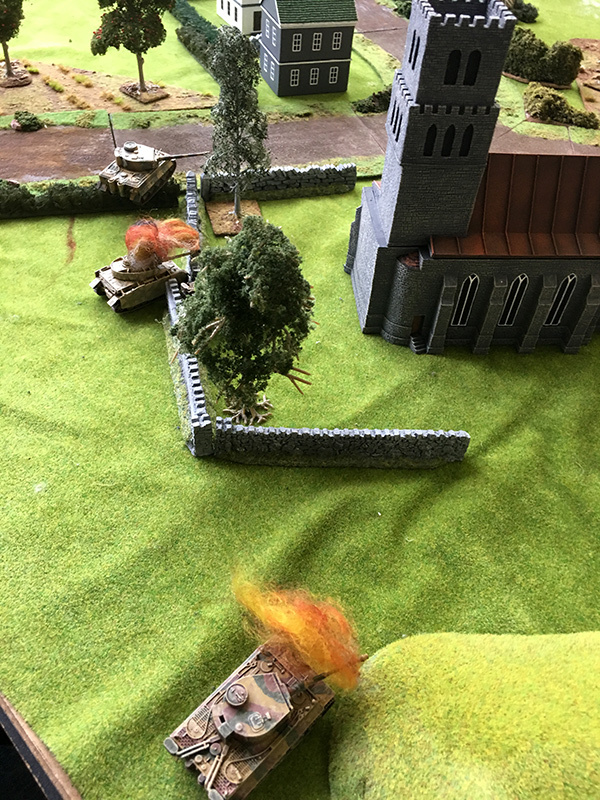 No damage inflicted this turn. 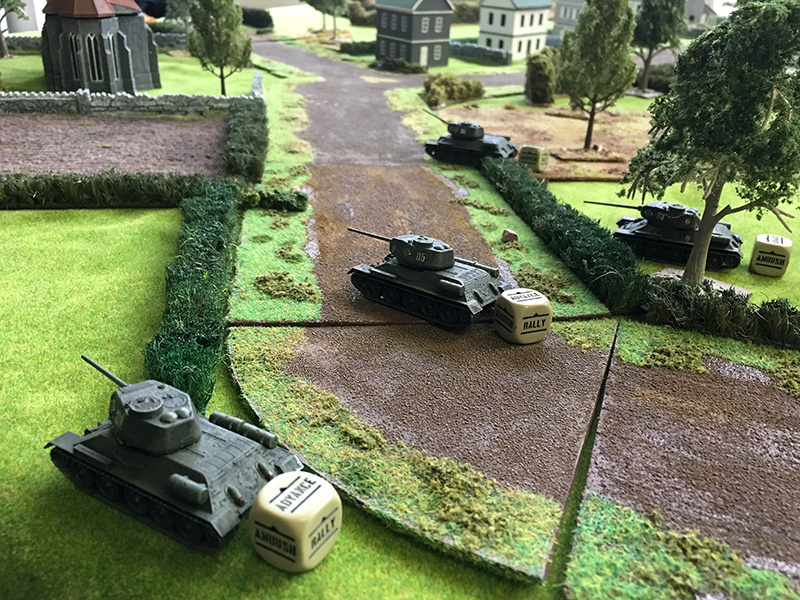 Turn seven and the IS2s close in on the Germans while the T34’s are still maneuvering to get a tactical advantage on the Tigers. 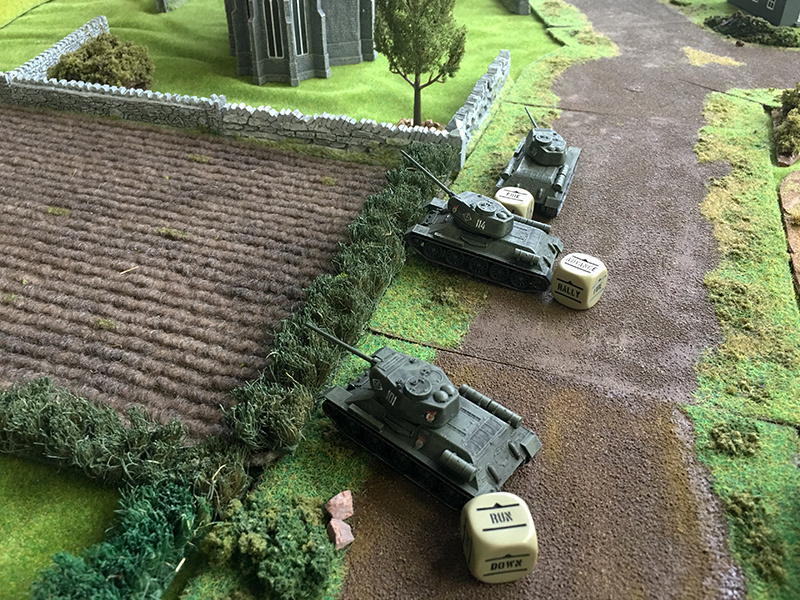 One of the T34s manages to put a couple of pins on one of the remaining two Tigers. 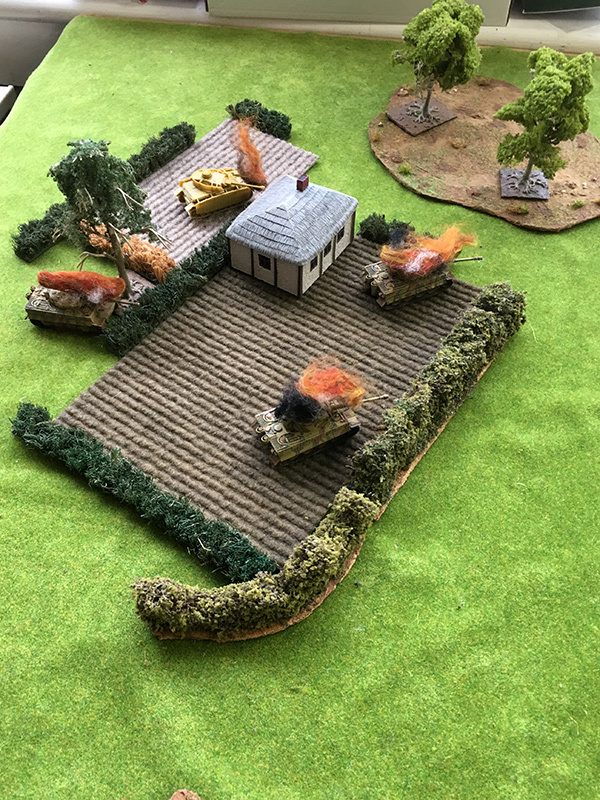 Turn eight and that was it for the Germans, the last two Tigers took hits wiping out the German force, though they did manage to take a T34/85 with them. 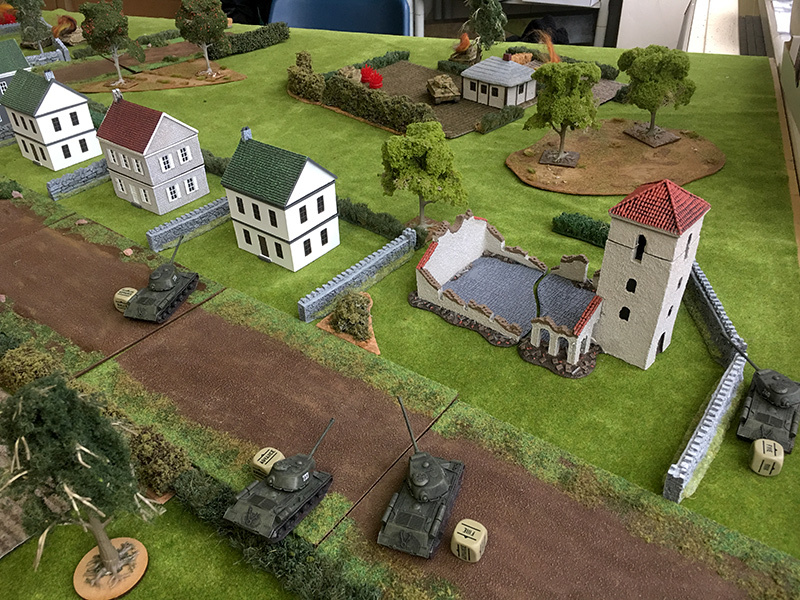 Final score was 8 out of 8 losses for the Germans and 3 out of 9 for the Russians. 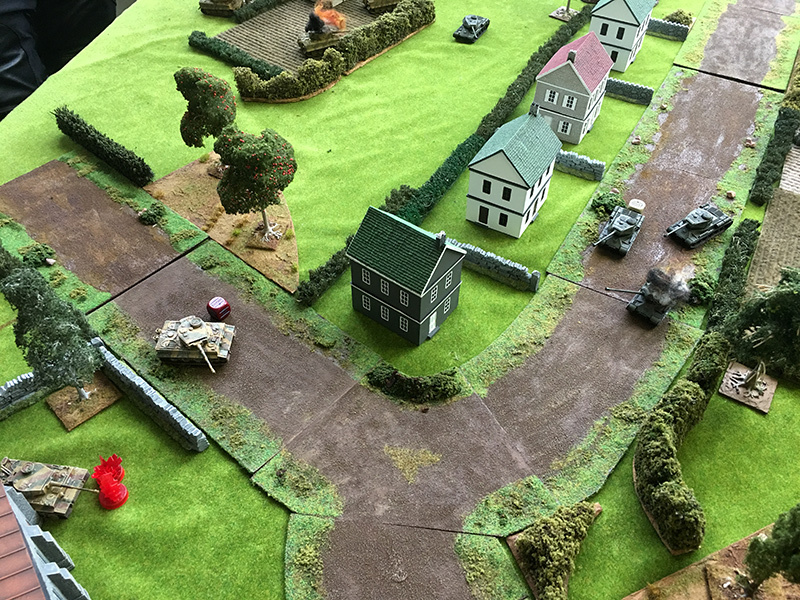 A thoroughly enjoyable game of Tank Wars with no infantry and a second run out for my 15mm tanks.